It is a medium size irrigation project constructed at a cost of Rs.80 crores during Nizam government period during 1945-48. 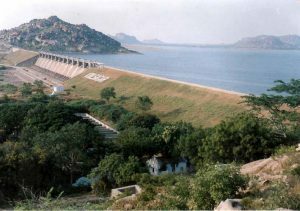 It is located about 12 Kms from the Devarakonda Mandal head quarters in between Mahaboobnagar and Raichur. This project was constructed to meet the irrigation needs about 12 thousands acres. It is a beautiful project and was constructed in a picturesque location between two mountains on PeddavaguRiver. There is a guest house near the project from there you can have a beautiful look of the project.Location and Reach: Road: Visitors can reach the destination either from Hyderabad (130 km away) Raicher (110 km away) from Mahabubnagar It is 37 kms away. Rail: The nearest railway station is located at Devarakadra, which is about 12kms Air: The nearest Airport is at Shamshabad (Hyderabad). The Porject is under the jurisdiction and control of major irrigation department and Government of Telangana.